As the true Canadian, I believe maple syrup is the liquid of the gods (or something close to that!). When combined with bourbon and pecans, which go so well together on their own, this recipe was definitely a crowd-pleaser. I wanted to make a different pecan pie, so I found a couple recipes where I liked a bit of this and a bit of that and came up with the following. Scroll down for more pictures, hope you enjoy! In a food processor, pulse the flour, salt, butter, shortening, and sugar until it forms a sand-like consistency. Turn on processor and slowly pour in milk until it forms a soft, slightly-wet ball (add more milk or flour if need be, it should be slightly sticky, yet able to remove from bowl). Lay out a piece of plastic wrap and form dough into a flattened ball on top, then wrap and refrigerate for 30 minutes. Preheat oven to 400oF. 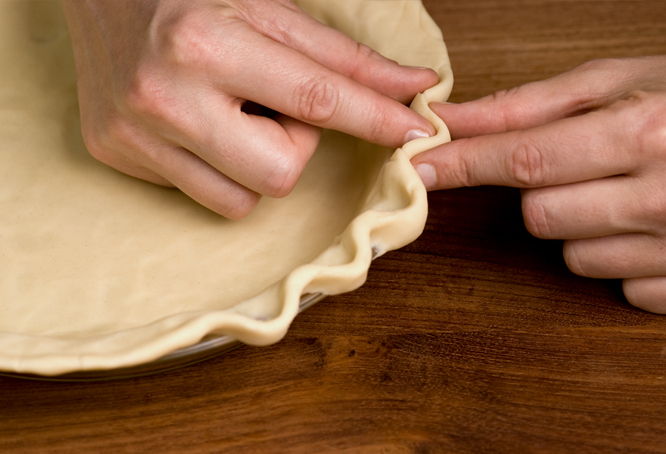 Roll out pie dough into a circle large enough to fill a 9 inch pie dish. Lift into dish, press down to fill entire pan and tuck in extra to form a small dough lip (you can remove some if there’s too much in places). Pinch lip between offset fingers to make a scalloped edge (like this and see below). Line with parchment paper, fill with dried beans and bake in oven for 20 minutes. Remove from oven and lower temperature to 350oF. Combine filling ingredients in a large bowl, stirring well to combine. Pour into crust and bake for 40 minutes, until center of pie is almost set. Keep an eye on the pie while its baking, you will probably need to shield edges of crust with foil when it gets golden brown to let centre to continue to cook. Cool on a wire rack and enjoy! This is such a gorgeous pie!! Amazing job, looks delicious! Wow!!! 😍😍😍 Such a perfect pie! And it sounds SO perfect for fall!